There are a lot of ways to go about appealing to the Academy when trying to score Oscar nominations. One way to is blanket Oscar voters with all aspects of the movie, hoping that they vote up and down the line for it. Another way is to just zero in on one small feature of it, be it a performance, the writing, or a technical category. For most independent awards contenders though, they use what I like to call a "targeted Oscar campaign". It's a mix of those two aforementioned methods, basically amounting to shooting for the big categories you think you can score a nod in and all but ignoring the long shot nominations. 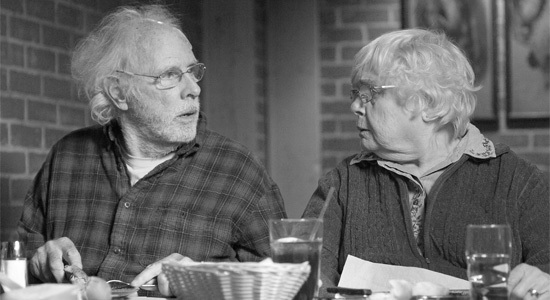 For a while now, that's been how Alexander Payne films have gone about campaigning, Nebraska is the latest example. The flick begins its theatrical run this coming weekend, but the Oscar voters are already getting charmed. I saw the film back at the New York Film Festival and enjoyed it, though I'll be frank and say that Payne has done better work in the past. That being said, Bruce Dern gives a career best performance (which is saying something), Will Forte is a big revelation, June Squibb totally steals her scenes, and it's impossible not to watch this flick and imagine that the older members of the Academy won't fall head over heels for it. It's just the type of movie that they like and that aforementioned targeted campaign is going to hone in on getting their votes in a big way. In a targeted campaign, not only do you seek nominations in specific categories, you seek them from specific voters. With Nebraska, not only are you looking for older white male voters to latch on to the work, you're looking for the acting branch to embrace it too. Just look at this report a few months ago about how well a SAG screening of the film went as evidence of the enthusiasm that this sort of campaign can drum up. The movie may not inspire fireworks of adoration everywhere, but in the right environment (as you can see in that article) it can seem like one of the best films of the year. What specific categories do I mean with this targeted campaign idea? Well, with Payne's work, it's always been about the big top tier slots, which is to say Picture, Director, whichever Acting categories are applicable, and Screenplay. Throughout his filmography, only one time (not counting Nebraska) has a film of his not scored at least one nomination, and all but one have scored multiple nods. Now, those noms have only so far translated into a pair of Adapted Screenplay wins for Payne and his co-writers, but the interesting thing to note is that only once has a film of his gotten a citation in a technical category. For all of the great efforts on display behind the scenes, movies like About Schmidt, The Descendants, Election, and Sideways have been all but ignored on that front. The one time a below the line credit was honored, it was a nomination for the Film Editing in The Descendants. In looking at where Nebraska will likely compete, it's prudent to look at Payne's two most honored works, which are The Descendants and Sideways. Both won Oscars for Adapted Screenplay, which won't come into play this time, but they each were both nominated for Picture and Director, with the former scoring a Lead Actor nomination for George Clooney, while the latter got a Best Supporting Actor nod for Thomas Haden Church and a Best Supporting Actress nom for Virginia Madsen (leading to five nominations overall for both titles). They each were victims of notable snubs too. The Descendants missed out on Supporting Actress for Shailene Woodley while Sideways had Paul Giamatti miss out in Best Actor. This time around, most prognosticators like myself foresee Nebraska getting between three and six nominations overall. The key will be if any of the techs come into play. The film will seek nominations for Best Picture, Best Director for Payne, Best Actor for Dern, Best Supporting Actor for Forte, Best Supporting Actress for Squibb, Best Original Screenplay for writer Bob Nelson, and honestly probably just that. Now, that's not to say that the black and white visuals on display won't wind up getting cinematographer Phedon Papamichael his first nomination (after missing with The Descendants) or that Best Film Editing isn't out of the question, but the campaign is going to focus on the big names. That's where Nebraska will live or die. In my current predictions (which yes, have already slightly changed from that last update I published here), I have the film getting four nominations (Picture, Actor, Supporting Actress, and Original Screenplay) and actually am debating if it can win two of them (Actor and Supporting Actress). It wouldn't shock me at all to see Payne wind up in the director line-up either, but he's got some strong competition to deal with there. As you can see, a targeted campaign leaves you very little room for error, but it also can give you a greater chance at success. The consistent number achieved by Payne's last two flicks should inform you as to how this one will do, but the precursors will ultimately play a big part. If they embrace the movie, particularly in terms of giving Dern some wins, it'll bode well for the film. My guess is that something along those lines will be just what happens, but we won't know for another month or so. Until then, Nebraska will just have to continue along with this targeted campaign, and trust me, I'm sure Paramount is happy to do so. 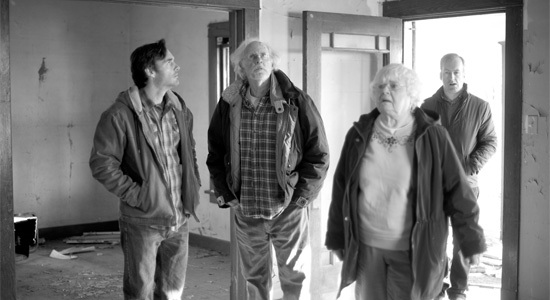 By the way, stay tuned for our interview with Bruce Dern later this week! Can't wait for that Bruce Dern interview! As long as the product is good I personally have no problems with movies designed around winning an Oscar. Me either, it's all about the quality to me in terms of whether I'm supportive of a nomination or not. Agreed. This film knows exactly what its strengths are and exactly who will enjoy it. Despite it being comparitively "smaller" than a lot of the big contenders, I expect it will do quite well overall. Sounds like a smart way to go about this.